Have you ever been casually cruising down a street, enjoying the silence in your car as opposed to the usual blasting of the radio, when your vehicle suddenly lets out a long whine? In turn, you’ve let out a loud groan because you know when your vehicle makes a noise like that, it can’t be good news! Well, to narrow down the bad news, this whine can usually be recognised as a power steering pump noise. You’ll only hear this noise when your engine is turned on and running, as the pump is run by an accessory drive belt. So, regardless of your vehicle being idle or on the go, the noise will be heard and its pitch and intensity will vary depending on two things: your engine RPM and when you turn the steering wheel. This power steering pump noise is only affected by the speed of your engine, not the speed of your vehicle, hence an increase in RPMs will affect the strength of the whining sound. Whereas the pitch of this noise will be affected more when you turn your wheel to the left or to the right, due to an increase in the pressure inside the pump to turn the wheels in that direction. 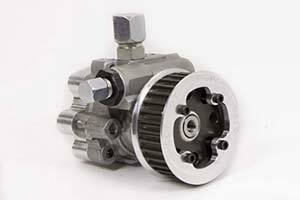 So, we’ve established the whining is coming from the power steering pump, but what causes it? Well, read on to find out why your power steering pump is making this noise! What Are The Causes Of The Power Steering Pump Noise? If your vehicle is suffering from a whining power steering pump, you should check the level and quality of the power steering fluid. If the level is low, top it up and if the oil is contaminated or has lost its viscosity, be sure to change it. When a power steering pump is run dry or the oil is either contaminated or lost its viscosity, the bearings in the pump can get damaged and you’ll end up with a noisy pump. Also, contaminated oil can cause scoring on the pressure plates inside the steering pump and this can result in lack of pressure, which in turn can cause the steering to go heavy but also, it can lead to a noisy pump as well. Furthermore, the contaminated oil can damage oil seals, causing steering fluid to leak from the pump. It’s possible the whining noise is simply coming from trapped air bubbles in your power steering fluid. If you suspect this is the case, you can confirm it by removing the cap from the power steering fluid reservoir and checking if any bubbles or froth has formed in it. You will need to flush the power steering fluid in order to get rid of the pesky air pockets if you find this is the cause of the noise. However, to avoid any more air getting trapped in the fresh fluid, ensure you check all the connections from the reservoir to the pump, tightening any loose ones. It’s not as common to check the power steering fluid as it is to check the engine oil, for example. So, you’re less likely to know if you have low levels of fluid until your car starts showing symptoms of it. How can you tell if you’re running low on it? Just simply take the cap off the power steering fluid reservoir and see if the fluid sits below the minimum mark. For a more detailed guide on this, check out our article: How To: Check The Level Of Your Power Steering Fluid. If your check confirms the power steering fluid levels are lower than they should be, you have a leak in your system that you need to find and fix. As with most fluids, power steering fluid can become contaminated and thus break down over-time. In turn, the constant circulation of this old fluid can wear down you’re the components in the power steering system and it can also trigger the power steering pump noise that we really want to avoid hearing. What is the simple solution to this? Well simple to say, a little harder to do, but you will need to flush your old power steering fluid and replace it with a suitable fresh one. One thing to remember, if you hear your car whining, you should get it checked as soon as possible! If you ignore it and continue to drive with it continuously making this noise, you will only risk causing further damage to the power steering pump and possibly to the other components of the power steering system. So, avoid letting this power steering pump noise label you as ‘the one with the noisy car’ and book your vehicle in with Power Steering Services today! We’ll find the root cause of the noise and proceed with any repairs or replacements you may need! Call us today on 0208 853 3343. Tags : Car Makes Whining Sound, Power Steering Pump Issue, Power Steering Pump Noise, Power Steering Pump Problem, Power Steering Pump Whine, Why Is My Power Steering Pump Making Noises?, Why Is My Power Steering Pump Whining?. ← Bad Steering Rack: Signs To Look Out For!